CLUB ULTIMA, from its haven on the top nine floors of the 20-storey Fuente Tower puts you the right at the city's epicenter in close proximity to the major points of commerce and recreation, and in the plain view of the very wellspring of the city's over 500 years of history, charm, warmth and hospitality. In its footprint will rise the tallest building outside Metro Manila, the prestigious CROWN REGENCY HOTEL, offering 35 storeys of De Luxe accommodations and World-class dining, banqueting, entertainment and conference venues, equipped with-up-to-the-minute amenities and facilities. On a clear day, its Crown Deck serves up an exhilarating 360* view of Mactan Bay, the majestic mountains ridges of Bohol and Negros, and the metropolis at your feet. The ultimate in private city club lifestyles is now your's to experience. Our mission is to provide you- businessperson, entrepreneur, executive, professional- and your family a second address that is second to none Enabling you to move into a welcoming community of new friends and new opportunities in an exclusive, all-inclusive environment where everything relevant to celebrating business and social connections and enriching the quality of your travel is at your fingertips. THE BEST PART IS, ENTRY TO CLUB ULTIMA IS AT ONCE AFFORDABLE AND ACCESSIBLE. The CLUB ULTIMA is the one-stop source for office services and facilities that create the best impression of you and your organization. Our business center is open 24/7 and manned by professional staff and on-call trade experts ready to deliver a range of products and services to assist you. Fully-furnished office suites provide a most prominent business address. State-of-the-art communication, media and IT facilities, grant instant access to the regional and global marketplace. Highly-trained staff will answer your calls on dedicated phonelines, st your appointments, handle confidential mail, relay messages, and make your travel arrangements. Conference rooms, reception areas and lounges create a natural environment conducive to working and meeting---and signing on the dotted line. HOTEL readies itself for occupancy, avail of the club guest room that are your home away from home should you need to stay the night or many nights you want to stay. CLUB ULTIMA everything you need for successful social and business transactions is seamlessly combined with life's quite pleasures. Dine in our high-in-the-sky restaurants with the panoramic picture-perfect views of the city and environs, chill out with friends at the bar, release the day's tension in our rejuvenation spa, enjoy the pleasure under the healing ministrations of our wellness experts. Our gym, join our aerobics class, perfect your tai-chi-moves, or just jog, Play a round of virtual golf or a game of billiards in the game room. Dive into the pool, get a manicure/pedicure at the salon. Head for the pantry and help yourself to a few energizing calories-in a health drink or a wedge of rich pastry.Or go to our Library..or a nap in our snooze lounge. 1.RESTAURANTS AND BARS- CHINESE RESTAURANT with our Hong Kong chefs. Also other types of foods, menus and dishes. 2.BAR LOUNGE- in 18th floor serves refreshments, cocktails, and substantial snacks-to -share with family and friends. 3.All-Day Dining Cafe- in 18th floor with matching city view.On the17th floor by our glass enclosed, temp-controlled swimming pool, our outdoors-become-indoors cafe is the classiest response to the coffee bar phenomenon. 3.HEALTHY HEART RESTAURANT-The sophistication and originality of the food located in the Wellness Center, the restaurant which wraps around the 15th floor. 4.VIEWING DECK- Our all-glass, see-through, members only elevator will zoom you up to the 20th floor for knock-out vistas of Cebu City and its environs. 6. LIBRARY- 18th floor, stocked with the latest periodicals and select reading matter. 7.SWIMMING POOL- Who can resist a refreshing dip in our all-weather, indoor, solar-heated swimming pool with infinity edge? 54 luxury guestrooms and suites are your home away from home. Every conceivable in-room amenity has been provided solely for your comfort and convenience, including: orthopedic mattresses, individually-controlled air conditioning, NDD-IDD telephone, fax and internet capabilities, cable television, mini-bar, bedside control switching systems, safety deposit box, hair-dryer. when the neighboring CROWN REGENCY HOTEL is completed, another 46 guestrooms will be alloted to club ultima members. Open 24/7 this is your one stop office resource manned by professional staff and on-call trade experts to cater to your needs. -HELIPAD--AVAILABLE FOR MEMBER'S USE, REQUIRING 24-HOURS NOTICE. -LAUNDRY & VALET, LOCKERS AND SHOWERS, WARDROBE MANAGEMENT. This is a fountain of youth, Our WELLNESS CENTER- incorporating rejuvenation spa, ultra private surgical aesthetics facility, gym, fitness activity, beauty salon, and healthy heart restaurant. -FITNESS ACTIVITY- Full service gym, Indoor jogging track, Aerobics, pilates, strength training and body toning classes, Boxing, Tai-chi, Yoga classes. Superior teams of aptly trained doctors, technicians and health maintenance personnel are in charge at the HEALTH HORIZON. State-of-the-art diagnostic machines such as MRI, CT scan, X-ray, Ultra sound, 2D-echo, EEG, ECG, video gastroscopy, video colonoscopy, ophtha, ENT, dental, derma, and bedside dialysis equipment together with top of the line laboratory, testing tools are among the main features in a hotel-like-environment. This health benefit will be an integral part of CLUB ULTIMA membership privileges and can be enjoyed in every Health Horizon destination. 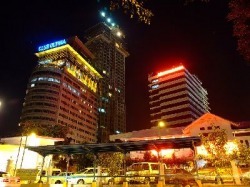 CLUB ULTIMA PRIME is the newest addition tot he the Fuente Triangle Realty Development Corporation. Its the "creme de la creme".